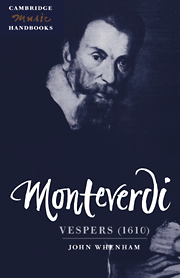 Monteverdi's Vespers is an exceptional collection of sacred music, both in the inventiveness of the compositions that it contains and in the debate that it has provoked over its use in the seventeenth century and over Monteverdi's intentions in publishing it. This Handbook provides a guide to the music in all its aspects – from an introduction to the service of Vespers itself, through the practice of chanting psalms in plainsong to analysis of Monteverdi's settings, ranging from the rhetoric of the motet 'Nigra sum' to the sub-text of the psalm 'Laetatus sum'. It also examines the issues involved in performing the Vespers and evaluates various scholarly debates on the music, challenging the long-held ideas that the sacred concertos are antiphon substitutes and that the music could not have been performed at Santa Barbara, Mantua. The book includes the texts and plainsongs used by Monteverdi, and a discography.